Who doesn’t love the ease and speed with which you can purchase and receive items through amazon prime with the touch of a button on your phone? You can practically never leave the house with all of the options they have available! 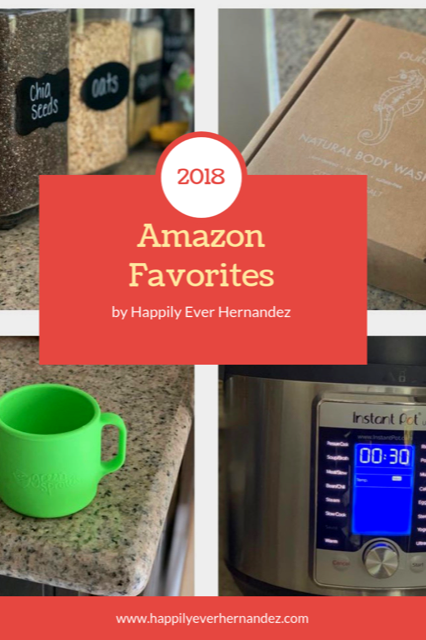 In this post I will share with you my amazon favorites and deals that I found in 2018. This gift guide should have something for everyone special in your life. Dessert Essence Toothpaste: This toothpaste is fluoride and gluten free. The brand is leaping bunny certified, meaning they are cruelty free with no animal testing. I love how clean it makes my teeth, and you will too! This is an essential item on my amazon favorites list. Primal Pit Paste: I got the unscented version, but I will probably try the lavender next time. Sometimes it is nice to have a fresh, natural scent. Every ingredient is food grade, safe, and non-toxic. This is great, because a lot of products contain chemicals that are bad for your health. 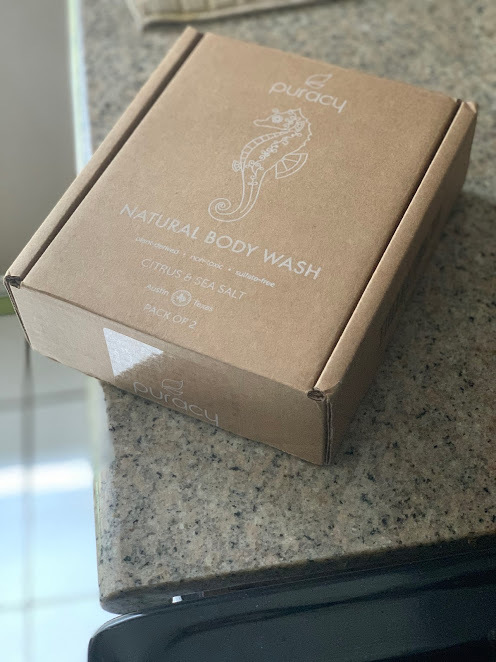 Puracy Body Wash, Shampoo, and Conditioner: I love the natural citrus scent of these local, plant-based products. They are biodegradable and recyclable. The artwork on the bottle supports local artists. With every purchase they donate to support those in need. Apple Cider Vinegar: Apple cider vinegar is great for your health. You can add it to different recipes, use it for cleaning, and more! I talk about how this helped heal my baby’s eczema in this post. I included this in my amazon favorites, because of its diversity and usefulness. Mega Food Baby&Me 2 Prenatals: After giving birth I learned about the importance of finding a prenatal with methylfolate rather than folic acid. It is best, because it’s bioavailable and easier for your body to absorb. I love how this vitamin is made with non-GMO whole foods and didn’t make me feel sick. The one thing I didn’t like is the flavor even just to swallow it and how you have to take it twice a day. Cobalt Blue Glass Jars: We used these jars to hold coconut oil when we needed to moisturize my son’s skin on the go for his eczema. These jars are also great if you are making DIY lotions or soaps. They come in all different sizes. You can use these as travel size containers to hold your products when you go on trips. Organic Seaweed: We love to make our own beans. It takes remembering to soak them the night before, but the taste is so worth it. I had trouble finding seaweed to soak it in stores, so this is great! The seaweed is good for breaking down enzymes that can make them hard to digest. Arnica: Pain and swelling reducing medicine can be bad for your liver. This is a great, effective, natural alternative that I like to use in our home. We try to avoid medicine, but sometimes we get a bad headache or our baby has teething issues. So, we use this to alleviate some of the pain. Renzo’s Iron: At one of my baby’s pediatrician checkups they tested his iron levels and he was a little low. He eats a lot of iron rich foods, so I looked into supplements. This was the best one I found. The best part is my son loves to take it. When we got his iron re-checked it was well above average, and we only give this to him every few days. Oral B Toothbrush Heads: We got these for our electric toothbrushes, so we only have to replace the heads instead of disposing a whole toothbrush every month. Some dentists recommend electric toothbrushes, because they may help clean your teeth better than brushing by hand. Baby Banana Toothbrush: This toothbrush doubles as a teether. It is easy to clean, and is great for brushing your babies’ teeth and gums. Every Man Jack Deodorant and Body Wash: My husband loves this deodorant. He says its the only one that doesn’t give him a rash. The body wash smells nice and works great! I had to include this in the gift guide, because if you’re going to give a gift, practical is the way to go. Hair Mousse:My husband likes something to style his hair with, so I found this for him. He is very particular about what he likes to use. He would use my shampoo and conditioner until I got this. Silicon Hot Handle Holder: These are the best handle covers. They are perfect for cast iron skillets so you don’t burn your hands. I’ve tried other handle covers, but they didn’t cover the whole handle or would fall off. This has to be one of my top amazon favorites of this year. Tumbler Lids: This is my favorite tumbler! It can hold a lot of water and keeps it cold all day so I stay hydrated. I’m so clumsy that I drop my cup a lot. So, I ordered a bunhc of these lids to always have one on hand. Another perfect practical gift I couldn’t resist adding to the gift guide. 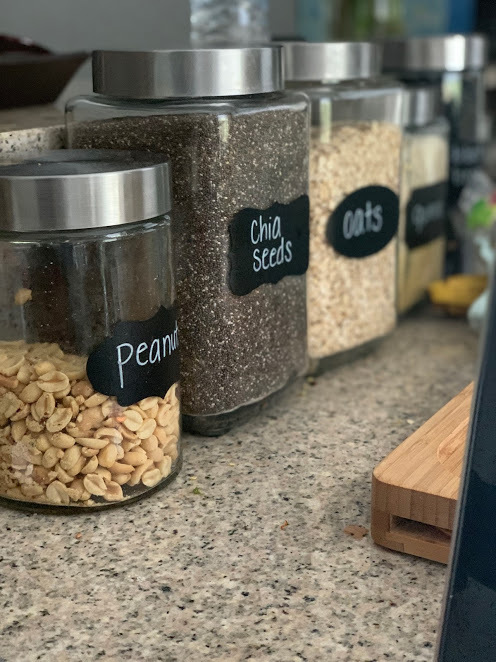 Chalkboard Stickers: I wrote on these with a chalkboard marker and used them label some of my pantry staples. I’m working on creating less waste in our home. I love how organized our pantry is starting to look. Pot Lid Organizer: This fits in our cabinet, and keeps all of the lids easily accessible in one place. One thing you should know is that some thicker lids may not fit nicely. So, pay attention when ordering to the sizes of the different slats. Spice Rack: My favorite thing about the rack is that it comes with labels for common spices. It is so easy for me to find what spice I’m looking for now. Everything looks nice and uniform. I would recommend that you purchase some type of funnel to help you transfer any spices you have into the new containers. The jars are all glass. In the future I plan to purchase spices in bulk and just bring my containers along to keep it low waste. Toaster Oven: You can get this 20% off right now! This is a must have kitchen appliance in our house. Microwaves heat up and kill nutrients in your food not to mention the dangerous radiation that emits when they are in use. We use this multiple times a day. It can bake pizzas, heat bagels, make toast, and do anything that a regular oven can do without using as much energy. This is one of my amazon favorites that I would recommend in everyones kitchen. Toaster Oven Rack: Since we use our toaster oven so often, we purchased an extra rack. This is helpful, so when we are washing one pan, we can use this one! 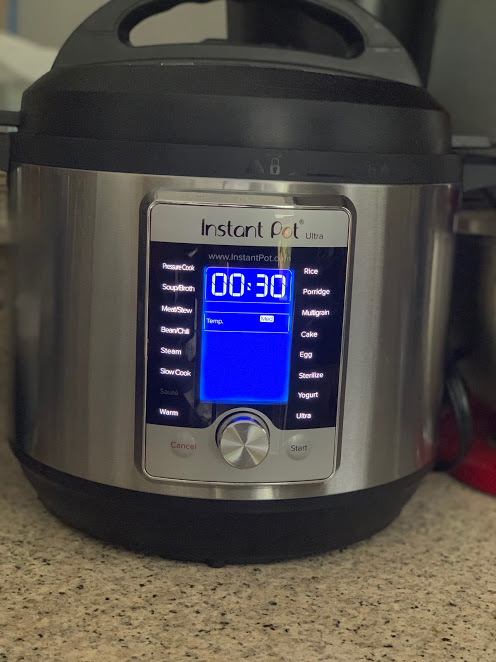 Instant Pot: We got this when it was at the highest discount we had seen and have no regrets! It is on sale now for $20 off. This is another appliance that we use almost daily. It is perfect for quickly cooking anything from potatoes to rice. 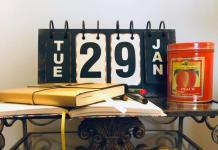 There are endless recipes you can find out there to make quicking easier for busy people. Another one of my amazon favorites kitchen staples. Can Organizer: It is $10 off right now. I love how it helps you organize vertically in the pantry to save space while keeping all of the cans easily accessible and within sight. Make sure you check the dimesions before you buy it to ensure that it will fit where you plan to use it. It seems to be a trend of mine that I don’t check and have trouble finding a place to put things. Planet Box: This is the best lunchbox I’ve ever had. We use it weekly to bring snacks or meals along with us when we’re on the go running errands errands. It is well worth the price and will last for years to come. I love the magnet options to customize. Just, don’t forget to take the magnets off when you wash. I made the mistake of leaving them on in the dishwasher, and it rusted the first time. The lunchbox is great to ensure any cold foods stay insulated. The lunchbox also provides a pocket for a water bottle and any extra snacks you may want to bring. Stainless Steel Thermos: A thermos is essential for keeping anything insulated on the go. I personally love to use it to keep food warm when we go camping or are out and about. You can take/send it for lunch. Sink Caddy: Make sure you clean this every day to keep it in good condition. This is my favorite sink organizer. It looks nice and is perfect for keeping all of your sponges and dish washing brushes together. This is one of my simple amazon favorites. Grapple: I got this when my baby had just started sitting up independently. He would get bored, so I wanted something he could play with while he was in the high chair. This helped me be able to cook and clean for a few minutes. It is perfect for the stage when babies want to throw their toys, so you don’t have to pick them up every second. Green Toys Submarine: Such a great bath toy! My toddler loves to fill it up with water and pour it out. This brand has a lot of my amazon favorites. Wet Bags: These are great for if you cloth diaper or just to keep in your diaper bag. You can put dirty or wet clothes inside. The bags are easy to wash and have such cute patterns. There are multiple sizes to choose from. This should be on everoynes list of amazon favorites. Diaper Sprayer: Another cloth diapering essential. You won’t need one of these until your baby is around six months old. Once they start eating solids you will need to dispose of the poop before throwing the diapers in the wash. I love how this sprayer comes with a convenient attachment for it to hang on the side of the toilet making it easily accessible. Car Seat Travel Bag: This makes carrying a carseat through the airport less of a hassle. Even though you can fly with a baby in your lap up until two years of age, it is recommended that you pay for a seat and install your car seat. It is surprisingly comfortable to wear the carseat on your back with this carrier. Drool and Teething Pad: If you baby wear, these are a must-have. With all the drooling and teething that babies go through, these are great to have. You can easily wash them, and they come in different patterns and styles. Graco Extend2Fit Convertible Carseat: If for some reason you choose to check your carseat when traveling with the luggage, it may be a wise investment to buy a carseat specifically for travel. This car seat is super comfortable and is great for extended rear facing. Stainless Steel Cups: We got these cups for my baby, because he loves to drink water. I love how they come with silicon sleeves to help prevent slips and spills and assist with grip. 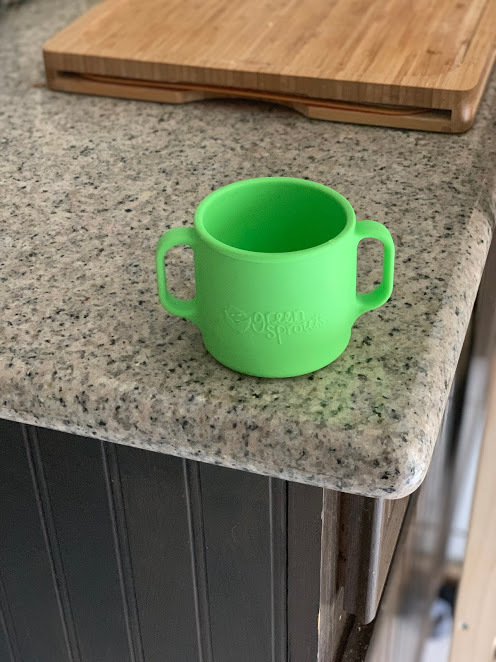 Green Sprouts Learning Cup: These have been the easiest cups for my baby to hold with one hand. Sometimes he’s eating and doesn’t want to put his food down to take a sip of water. The handles make it simple for him to hold both. Water Wipes: We love to use these when we’re traveling to easily clean up messes or wipe messy faces and hands. Touch and Feel Cards: My toddler loves to look at these every day. He names the different animals and makes car sounds. These are great for traveling to keep your child occupied. Also, they are a fun educational way to expose them to everyday objects. Tula Carrier: This is my top baby must have, so of course I had to include it in my amazon favorites. Every person and child is different, so I recommend you try to find a babywearing group local to you. In such groups you should be able to try and see what works best for you. Babywearing is so convenient, and is seriously the only way I can get my toddler to sleep or get anything done some days. Silicon Placemat: Hands down the best baby plate I’ve ever found. This one stands out from the crowd by having four corners of suction. Every other plate we’ve tried doesn’t stick to the high chair or my baby can get it undone. This plate stays, and has multiple sections for you to organize different foods. If you have to pick one fool proof baby item from this gift guide that eveyrone will love and make use of it would be this. Reusable Swim Diaper: Even if you don’t normally cloth diaper, it can be nice to have a reusable swim diaper. They can be placed over a disposable swim diaper for extra protection. These diapers can also be worn independently, and they don’t get soggy like disposable diapers do. Toddler Rain Jacket: This jacket is great for protection from the wind and rain. It is also just really cute, and will keep your toddler warm. Miracle 360 Cup: These are the best toddler cups for them to carry around while playing. They are durable and have a spill proof lid. At first when we introduced these, my baby wasn’t interested. But, when he got a little older he learned how to drink out of them easily. Klean Kanteen: I love this water bottle. It has a lid to prevent spilling. My toddler would prefer to not have to put as much effort into getting the water out though. Stainless Steel Snack Catcher: The best way for your busy toddler to eat on the go. I can’t get enough of these. We always seem to lose what we use the most somehow. These are perfect for little hands to carry around while preventing snacks from spilling all over the floor. Child Proof Magnetic Safety Locks:Essential for any home with a mobile baby. You can quickly install these on your cabinets to ensure your baby is safe from anything their hands should not be able to access. The ease of use after just requires you open with the magnetic key. It is one extra step that is worthwhile for the peace of mind and clean home that it brings by keeping your baby out of things they shouldn’t get into. Corner Guards: We got these when my baby started pulling up on things. They help protect your little one if they fall when they’re first learning to move around. The guards provide a cushion to any edges of furniture you add them to. You just remove the tape, and stick them on. Baby Gate: We have brought this with us through two different moves. We originally bought this when we had stairs, but weren’t used to it being there. I kept tripping and stubbing my toe in the hallway. So, we installed it in the doorway of the playroom for all three houses we’ve been in. It is easy to open, but even little escape artists won’t be able to open it since you have to push in a button on both sides and pull to open. I also chose this one, because I like the design aesthetic. Since we are renters, I also liked that the installation doesn’t require any drilling. Yet, it is pretty stable. It takes a lot of pushing to get it to budge. Furniture Anchor Straps:It is super important once you have a baby that is even pulling up to secure heavy furniture to the walls. In a split second your baby could pull it down and get crushed. This is such a small investment when you consider the huge consequences of not properly childproofing your home. The No Cry Sleep Solution: This book was so helpful. My toddler still doesn’t sleep through the night, and we refuse to sleep train. The book really helped us understand the importance fo trying to have a consistent bedtime routine. We still have a lot of hard nights, but I have seen a lot of improvements in the consistency and ease with which he falls asleep after implementing some of the suggestions in this book and seeing what worked for our family. How to Raise a Healthy Child in Spite of Your Doctor: This book has a lot of useful information on how parents can take their children’s health into their own hands. He shares how we should treat common illnesses at home and when it would be necessary to go to the doctor for help. The book is written by a medical doctor who is more natural minded. The Power of a Praying Parent: One of my favorite books. Stormie Omartian so eloquently shares the word of God and how it relates to raising our chlidren. She speaks through the Holy Spirit to help intercede for your child through prayers during crucial times of his/her life. Book of Prayers: I accidentally ordered this thinking it was a cheaper version of the book for a book club I joined. I almost got rid of it, but I’m so glad I kept it til I completed the book. This is such a great reference for you to find specific prayers she shared and read them. The Power of a Praying Wife: Another amazing book. Stormie has such a way with words. She is so wise, and I felt like I could relate to what she said. It was as if she was speaking directly to me at times. 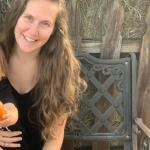 She has such helpful information from her experience as a Christian wife and mother. 31 Creative Ways to Love and Encourage Him: Such a fun workbook to complete with my husband. 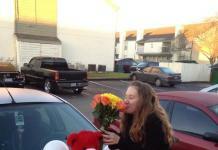 We got a version for Her that he read as well. It includes a section where you can journal to document the experience. Written by one of my favorite Christian authors, we pre-ordered their latest collaboration bundle- Family Teams, and can’t wait to learn more about building a family with a generational mindset. Teva Sandals: My husband ordered these for me for my birthday using amazon wardrobe. You can order three or more items sent with free return labels if you choose not to keep them. He knew I had been wanting some hiking sandals that are waterproof. I’m glad he chose these, because I liked them even better than the ones I thought I wanted. They are so comfortable and pretty cute too! Adidas Ultraboost: These are literally the most comfortable tennis shoes I’ve ever worn. It feels like I’m walking on clouds. I wear them every day. There was no way I wasn’t going to include them in my list of amazon favorites. Stride Rite Soft Motion: These were my baby’s first pair of tennis shoes. I found them when I was looking for the best shoes when babies first start walking. Unfortunately, I’ve misplaced the article I found that talked about the certification and why these shoes are so great. Stride Rite Sandals: We bought these, because my baby started walking in the summertime. He was able to wear them to splash pad and get them wet. We just left them out to dry in the sun or you can throw them in the dryer. Tsukihoshi Water Resistant Boots: They look just like hiking boots. In addition to being super cute, they are perfect for exploring outdoors in the fall and winter time to keep little toes warm. Tsukihoshi Tennis Shoes: On this blog you can read why this brand is great for toddlers. My baby quickly outgrew the soft soled toddler shoes, so we found this brand and love it! Method Dishwasher Detergent: I plan to do a DIY for this and laundry detergent soon, but if you want something to purchase this brand is clean and great! Cotton Re-Usable Paperless Towels: I bought these in hopes of reducing my waste. You can use them to clean around the house or to wipe your hands and face after a meal. You just wash them with all your other things in the washing machine! Bissell Steam Mop: This is well worth every cent. With a toddler we are constantly cleaning the floors. It is easy to use. All you need is water to havae sparkling clean floors. This is another amazon favorite that should be in every home. Dog Poop Scoop: Once we moved into a house and had a yard I wasn’t constantly watching our dog Hazel when she uses the restroom. I decided this would be the easiest way to keep our yard clean. 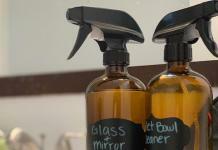 Amber Glass Spray Bottles: These are great for making DIY cleaning supplies. 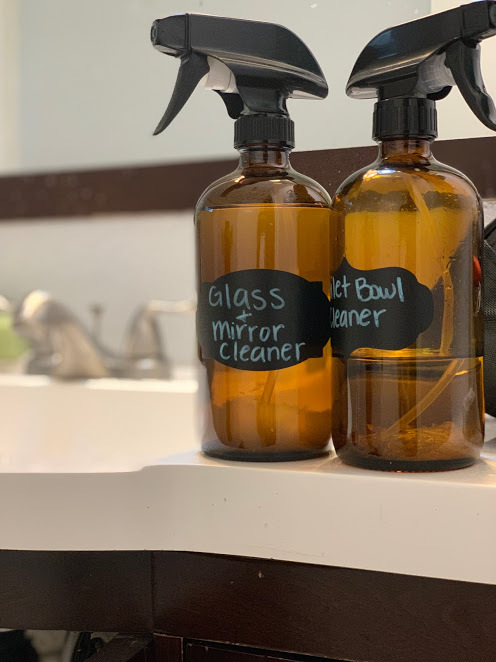 This is a great way to reduce your waste and rid your house of toxic products. It is important to get amber or cobalt glass bottles if you are using essential oils. Fabric Shower Curtain Liner: When we moved I was reading about how toxic that shower curtain liners can be. We decided to go with polyester as a safer alternative. We love it! It is easy to throw in the wash when necessary and stays much cleaner than plastic shower liners. You can also save money by not having to buy a curtain and liner. By far one of my amazon favorites for years to come. Toilet Paper Holder: Get it for almost half the regular price now! At our new house in the guest restroom there was no toilet paper holder installed. I found this, and it is perfect storage for the rolls without looking like an eye sore. Shower Curtain Hooks: At our previous house we got rid of shower curtains and rings, because our shower had a door and didn’t need them. We found these simple ones that do the trick. Summer Infant Potty: We aren’t doing any serious potty training, but my son was interested in the toilet. So, we got him this! He loves to sit on it and flush. It is so cute, and he has actually used it a few times. Pop Socket: Before I got my loopy case I purchased something similar to this except it was produced by amazon. I loved how easy it made it to hold my phone without dropping it. It was cool that you could push it closed when it wasn’t in use, so that it wasn’t bulky. 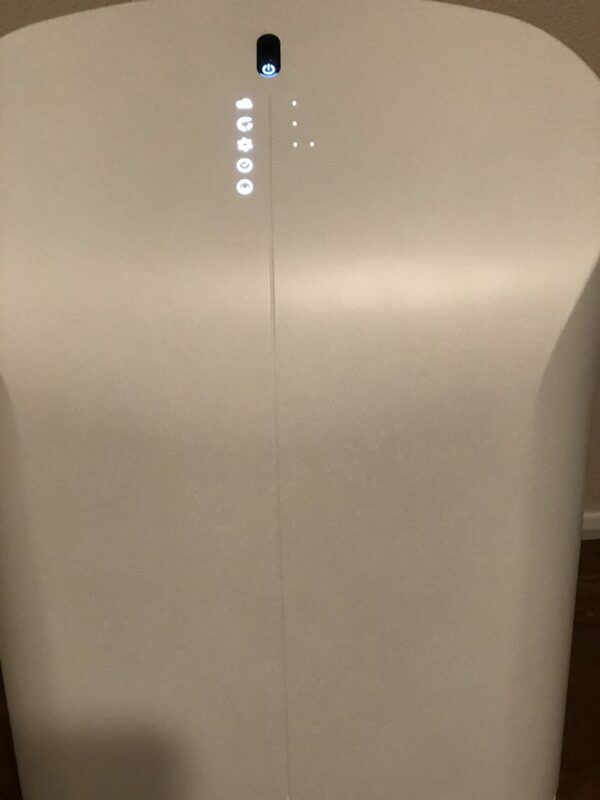 RabbitAir: We turn this on every day to make sure the air in our home is fresh and free from allergens. Since my baby has eczema, we purchased this to reduce environmental toxins that can cause him to flare up. iPad case: This has lasted all year. Through my toddler carrying it around while facetiming family and chunking it on the wood floor. It is super durable and easy for little hands to hold. I also love that it stands up making it easy to facetime family without having to hold the iPad. Echo Dot: There is an amazon deal at 40% off right now. We have one of these in almost every room of the house. This was another purchase that I was unsure about, but now I see the value as we use this multiple times throughout every day. We ask alexa about the weather every morning, have her play music for us, ask her questions, and check the time. I had to add this to the gift guide for all of the tech lovers out there. This is something you can only find on amazon favorites. Smart Wifi Router: My husband bought this internet router, because it delivers blazing fast speeds. It offers maximum coverage to provide the best wifi reception throughout the whole house. You can get it now for 25% off. Oral B Electric Toothbrush: Obviously we use our toothbrushes twice daily. My toddler loves to try to help and brush his teeth at the same time. You can purchase different heads to help you get a better clean. The charge will last you weeks, and the screen has cute features to help you know how long to brush each area for and if you’re using the correct pressure. Smart Plug: I was hesitant at first when my husband wanted to get these. But, I love them now! We’ve only hooked one up so far for our Christmas tree. I use it daily, and its so convenient to just tell alexa to turn it on and off when my hands are full. One of my original amazon favorites. Apple Watch: It is so nice to be able to check your notifications wherever you are. No matter how busy you are, all you have to do is glance down to ensure if you need to respond immediately. Other features we enjoy are the fitness tracking and reminders. We have multiple apple devices which all conveniently sync together. Anker USB C Charger: My husband, Ray, uses this every day to charge his apple devices. It gives speeds of 18W. This is one of his amazon favorites. Anker Dual USB Quick Charger: Another of his amazon favorites is this charger. This is 30% off right now. It is great for charging multiple devices at one time. This charger is perfect for travel. Anker Dual USB Car Charger: We love this car charger, because multiple people can charge at the same time. This comes in handy when you take long trips or go camping. Here is an ethical gift guide where you can feel good knowing your purchases are cruelty free and sustainably made! Another great gift idea is to DIY. 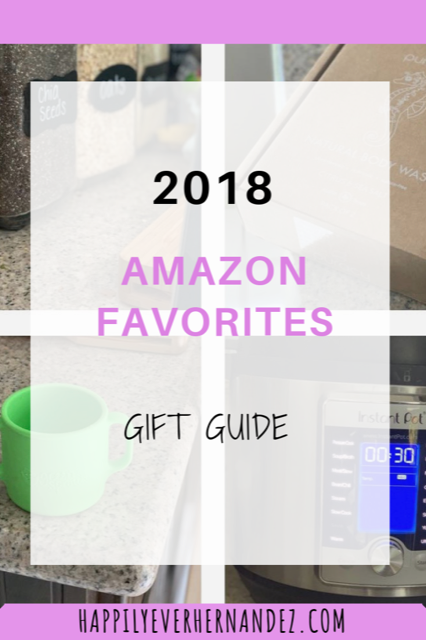 Some of my favorite bloggers have done gift guides sharing some great nontoxic gift ideas for everyone in the family. Check out: Wellness Mama, Gimme The Good Stuff, and Mama Natural. Sometimes the best gifts you can give are those that are not physical products, but experiences. If you enjoyed this list, check out my baby and toddler gift ideas guest post and my post on the best gifts for toddlers. Share this with your friends, and subscribe to gain access to exclusive, free content. Please let me know if you have any other favorites in the comments below!